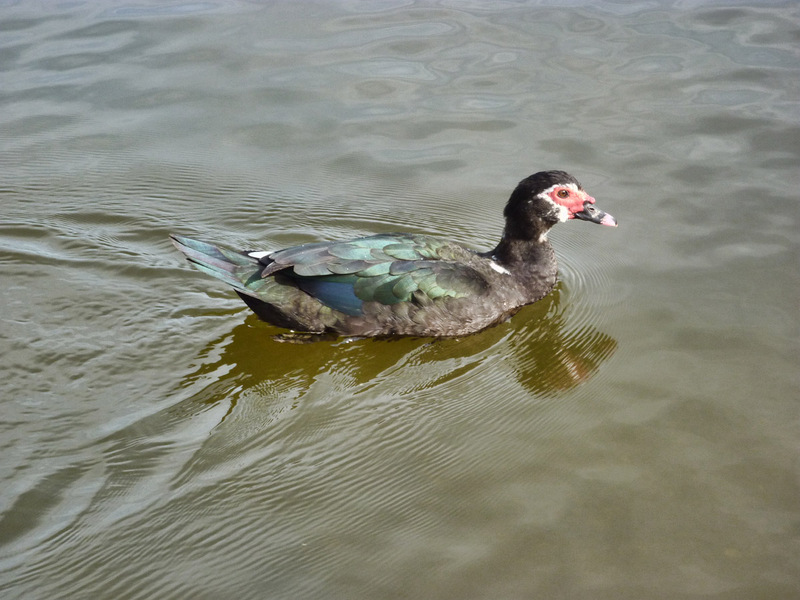 Bill caught this duck on his trek around Bonelli park this morning. The luxury of retirement ... choosing when to ride. The longer evening light and spring temperatures brought out the rest of us. One rider in pink shorts cruised up the road at 12 mph easily passing others. 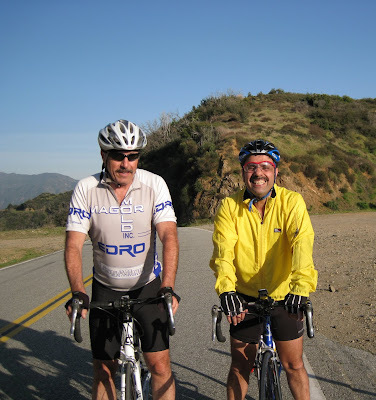 Rick and Mike of Rancho Cucamonga out for their first ride since September recognized my weekly mileage. It's always a blast to meet readership. Recommended reading includes Hog Wild and of course Snow Day. Tony started his spring training today with Matt by his side. Tony ran a 5km race on Sunday so his cycling legs were out of shape. Stopped by the reservoir. Rain predicted for Wednesday might overflow the upper damn. In Southern California the water won't last long. Enjoy the basin. My own time trial tonight was good. Under 31 minutes. Now for the recovery aspect of training. Sleep. Getting out to ride has been a priority. I put in three twenty mile rides this week over the previous week's 16 mile total. The weather this week excellent for the rides. Monday I headed out around 10:30 am on a rare day off. Jesse the Adobo Velo GMR time trial 2009 co-champion played tag with me along the road. I kept in front until Coyote Corner, the hairpin curve with the pine trees. Met Frank past the first saddle who put in back to back rides from Whittier to the shed on Sunday and Monday. Jesse putzed with me to the shed. Phil from the Hagens Berman team who raced in the San Dimas Stage Race asked about the nearest water. Camp Williams or the horse corrals. I came down solo and at mile marker 7.0 saw a double line formation of the Fly V Australia team headed north. Impressive to see the squad smoothly, effortlessly, float up the mountain. Wednesday afternoon was in the 80s as I treked along the road. I played tag with Daniel, whom I met two or more years ago. Working on intervals, fast along the uphills. Cranked out 11.6 mph on "the climb" from first hairpin turn or bottom of Monroe then easy pedaling to the S-bends. Once again pushing through the steeper parts of the road. Daniel caught me and then paced me to mile marker 10 where my time trial ends. Ron and Matt pushed past me. No gas left. I slugged along to the shed. Steve from SC Velo out for his first ride since his accident looked really happy to be on a bike. Clocked my best time of the year: 30:35. Saturday, brisk in the morning. I brought leg warmers. I knew it would get up to 80, but early in the morning the thermometer said 49F. The winds were strong. Jason and his friend breezed up ahead. Rick, the triathlete, Matt and I kept a steady pace. Adobo Velo riders put in multiple laps to the shed. Jesse finished early in the day. Brian from SC Velo shouted hello. Good to have lots of cycling company. Met a group of ladies from the Fullerton area practicing for the KOM Challenge. Mulholland is in two weeks. Everyone enjoyed the good weather including the motorcyclists. Check out the coyote who entered the race, the PAA fan club and more at SDSR-2010. Photo requests send an email. Bill has been busy editing and culling photos. His collection is here. We are still taking photo requests. 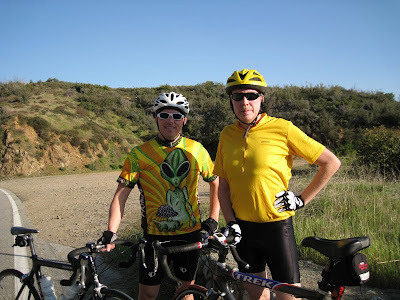 Bill and I have over 5,000 photos from the San Dimas Stage Race 2010. Chances are if you raced then we got you or your team. I have a few shots here, just drop an email with your name, team name, bib number and we will search and send you a photo. For the complete list of 2010 results were located SCVelo. Rode on the county fire fighter's helicopter and took aerial shots of the san dimas stage race. Slideshow from my first helicopter adventure. 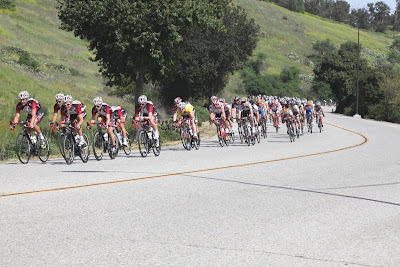 VeloNews covered the San Dimas Stage Race. Check out the photo credits. A break away group of four led the course for most of the afternoon of the Men's Pro peloton during stage 2 of the San Dimas Stage Race. Adam Switters (Bib #100) of Yahoo! Cycling Team challenged Ben Day of Fly V Australia for the maillot jaune (yellow jersey) and was the virtual race leader during the race. Fly V Australia at the front of the peloton eventually hunted down the rogue riders. United Healthcare/Maxxis took advantage of a late breaking surge in the final laps after their top ranked Chris Baldwin crashed in the next to last lap of the race. 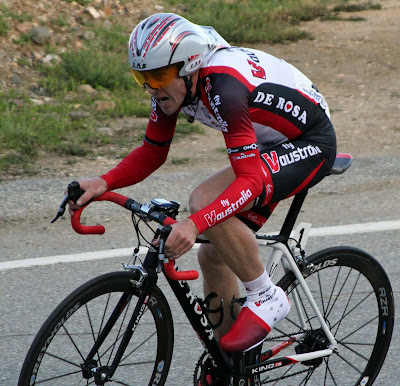 Rory Sutherland took first place for the stage. Ben Day retained the overall General Classification of race leader and will wear the yellow jersey in the San Dimas Road Race as the race continues on Sunday with the Old Town Criterium. 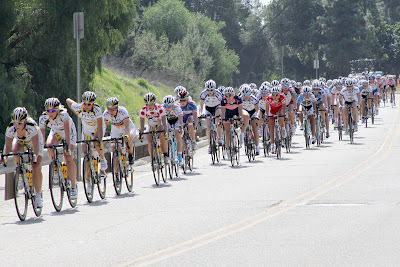 The Womens Pro Peloton on a lap around the San Dimas Stage Race. Read there story from VeloNews. Bill and I took several hundred photos of cyclists and motorcyclists on Glendora Mountain Road on Sunday, March 14th. Describe your vehicle, colors, make, model, number of riders and we will look to see if we caught you on "film". A State Champion practiced the course as well as many others. Good luck to all! 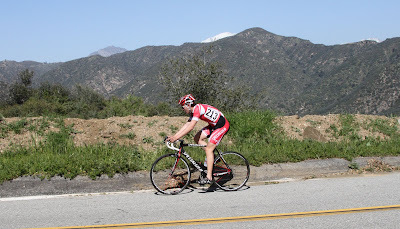 Centerline rules apply to the Glendora Mountain Time Trial of the San Dimas Stage Race. What this means is that the rider should stay right of the yellow lines in the middle of the road. The riders are trying to find the sweet spot of the road where the curvature is less pronounced, however crossing the yellow lines is called "shorting" the course. There will be fast moving descending traffic from previous riders and there are blind curves. I witnessed more than a dozen riders ignoring this rule (with photos) during the 2009 SDSR event. The USA Cycling Official penalized each rider with 30 seconds added to their final time. Floyd Landis will not be riding in the San Dimas Stage Race. Talks broken down when he requested accommodations at the "Hotel du GMR". This particular hotel is closed due to extensive yet pending bathroom remodeling. The futon bed in the "vacant" bedroom also needs upgrading in order to achieve a five star rating. Come visit the road anytime Floyd. Days away from the San Dimas Stage Race, the Department of Public Works scraped the edges along the road and smoothed out the ruts in the turnouts. The silty dirt encroached into the middle of the lane in stretches, with the light traffic I stayed in the middle for the most part. The sandy road conditions were in the first couple of miles. Friday the road will be heavily used with the bike event. Plan accordingly. The road will be open on Saturday and Sunday for all to enjoy. Road to Newman's Point tonight. Daylight Savings Time and warm 80+F weather made for lots of happy smiling people tonight. 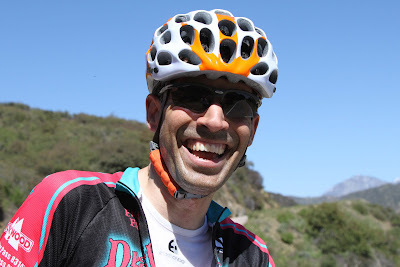 Working up to the King of the Mountains Challenge Rick of Dana Point will be racing as a Cat 5 in the San Dimas Stage Race this Friday. He has close family ties to the Basque Region in Spain and Rick favors the Euskaltel - Euskadi Team essentials with his Orbea bike and Euskaltel helmet. Tip to Rick: Mind the centerline otherwise a 30 second penalty is added to your score. Good luck! 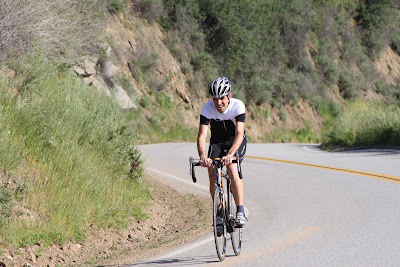 New to the road, Adam a freshman at Pomona College in Claremont road GMR to GRR down Baldy Road. 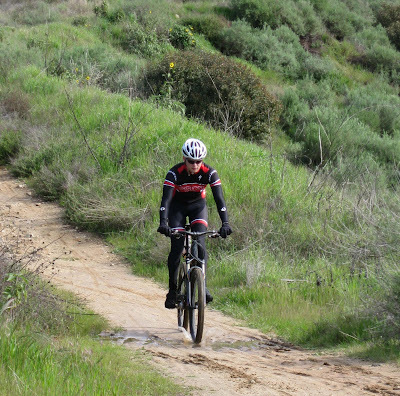 "Some parts were pretty steep for my bike (which doesn’t have much of a low gear), but I took my time and had fun." He drug his big camera along for the ride which made for a heavy backpack. (Do you know about Tinker Jaurez?). Check out his stunning results. 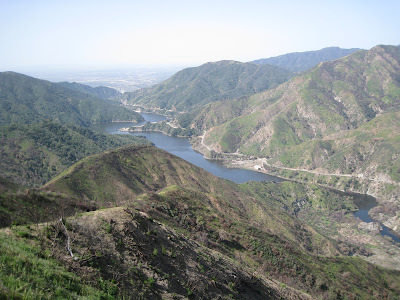 Adams view of GMR. 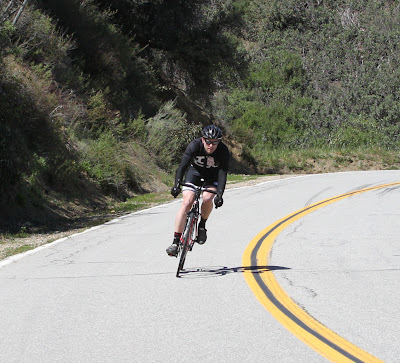 Only a week away the San Dimas Stage Race (SDSR) opens with a heart pounding time trial with 1000 feet of elevation in a short 3.8 mile segment of Glendora Mountain Road on Friday March 19th. Returning cycling heroes once again capture America’s attention and the San Dimas Road Race features its own brave warriors. Last year's overall champion, Ben Day is back with Fly V Australia team. The 2002 SDSR champion Hilton Clarke races for the Bahati Foundation Pro Cycling Team and is joined by the newest Bahati team mate, Floyd Landis. Women’s pro riders include 2008 champion Alexis Rhodes racing with Team Vera Bradley Foundation and 2007 champion Meredith Miller riding for Team TIBCO. The 2000 SDSR champion from the inaugural contest, Jamie Paolinetti, will race in the Masters 35+ group for the Amgen/UBS Masters team. 850 athletes are poised ready to conquer the road. Three days of cycling fun and adventure are open and free to the public. Including a free kid’s race on Sunday. For info SC Velo. * Glendora Mountain Road Time Trial starts March 19th at 9:00 am sponsored by Glendora Chevrolet. * Bonelli Park Road Race features a seven mile loop around the reservoir March 20th, sponsored by San Dimas Community Hospital. * The Criterium races short tight circles around Old Town March 21st, sponsored by Incycle bike stores and Cannondale bikes. 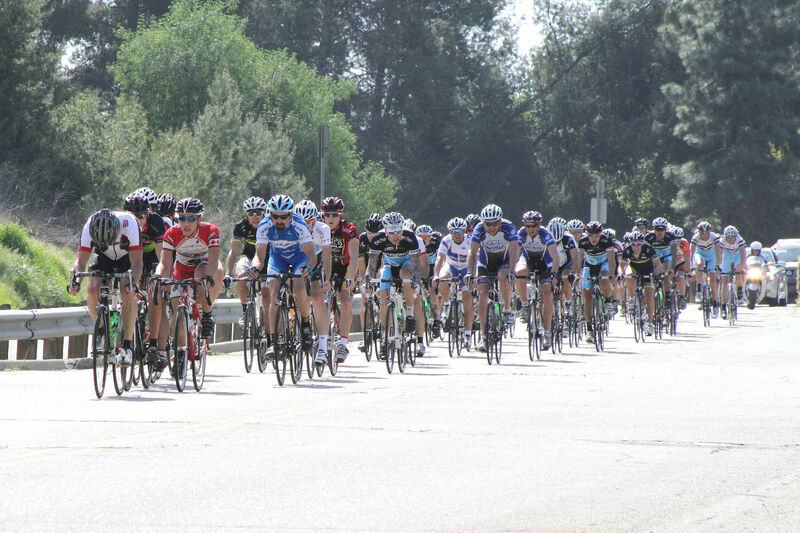 on FaceBook.com and follow it on Twitter.com - just search for San Dimas Stage Race. Rode out about 4:30 pm and debated about just turning tail and pedaling indoors. The feet kept turning the pedals even though the drops spit on me around mile marker 11.39. Not much. Kept going. Just a bit further. Got to the time trial end. Let the heart rate descend gracefully. Gentle pedaling. Then turned around. The rain proceeded to get heavier but nothing like the Dec 13, 2008. Just spitting. Not even Portland Dry Mist. Two other riders were going up as I came down. No signs of wildlife, the forest denizens smarter than the humans remained warm and dry in their shelter. The rain stopped at the gate. At 5:50 I could see the sun shining briefly through the clouds. It still had 10 minutes before setting. Longer days are coming. Next week is Daylight Savings Time. The trail was wet after a night of mild rain. Lots of dear tracks in the mud. Got lucky spotting this deer cutting across Poop Out Trail. The visibility was perfect to see the high rise towers of LA and beyond. Met up with Ian and Richard from Incycle. They know where to find the right items in the store chalk full of fun things. Richard slashed his tire. 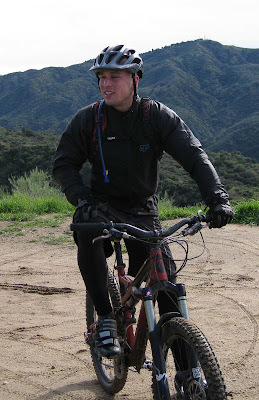 I carry a pump, tube and tools when I ride, but not when I hike. 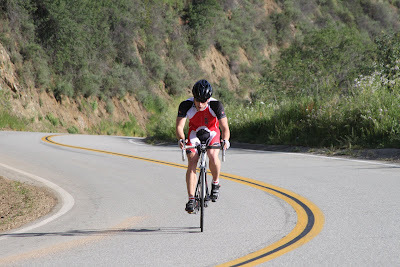 Hiked on GMR between 11:20 am and 2:30 pm with camera in hand shooting photos of cyclists training for the race and folks out having a great day on wheels. Chatted with Allen and Janet. Recognized Frank seconds too late as he breezed down the mountain. Met Guilluame, Richard and Matt of Torrance. I have alot of photos to go through before posting. Contact GMR with the time, color of jersey and bike. I need a couple more days to process the photos. I took over 300 photos in the afternoon. Over 130 in the morning. Who: Open to all kids ages 12 and under! 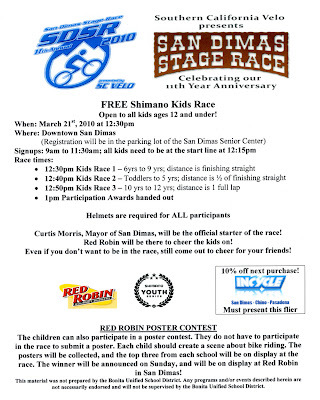 Curtis Morris, Mayor of San Dimas, will be the official starter of the race! Red Robin will be there to cheer the kids on! Even if you don’t want to be in the race, still come out to cheer for your friends! The children can also participate in a poster contest. They do not have to participate in the race to submit a poster. Each child should create a scene about bike riding. The posters will be collected, and the top three from each school will be on display at the race. The winner will be announced on Sunday, and will be on display at Red Robin in San Dimas! 33 Riders participating in the San Dimas Stage Race are in need of housing for two or three nights. A team of four female athletes from Northern California are among those seeking lodging. We also have riders from Minnesota and New York who also need a place to bunk. Contact Richard or GMR to volunteer your accommodations for one, two or more athletes. The event is March 19-21. Incycle is opening a new store in Rancho Cucamonga Friday evening. The event is free and starts at 5 pm. Special guests include Tinker Juarez, Rahsaan Bahati, Mirinda Carfrae and Sid Tamberlay. A raffle to benefit three charities the Bahati Foundation, the National MS Society, and SC Velo offers cycling gear and products including cycling apparel, accessories, and even a few bikes! Tickets can be purchased before hand at Incycle's stores in San Dimas, Chino and Pasadena. Two coyotes prowled the berm below mile marker 10.20 as dusk approached. One had its ears back in a defensive position. The bands of fur on their backs were of different lengths. I moved out of range. After 10 miles of hiking on Sunday my cycling legs were in good form. Every bone chilling moment rolling downhill felt refreshing tonight. Wheels are good.